Full details from the press release can be found by hitting the [Read More] link below. In Madden Ultimate Team, 20+ NFL legends and superstars will morph into super-performers during Halloween Weekend, going from great to truly fearsome. How fearsome? Imagine a player’s rating going from ~80 OVR to a 90+ OVR. Yea, that scary. Fans can find the super-powered players, like a Michael Vick boost from 82 OVR to 95 OVR, in MUT packs starting October 27th. In addition to discovering super-powered players in MUT, Madden NFL 17 fans can also find Halloween-themed players, challenges, live events and more for a limited time (Oct. 27 – Nov. 4). Finally, as fans get amped up for the Chicago Bears face off with the Minnesota Vikings on Halloween night, there will be a special Brian Urlacher giveaway for all players who login to Ultimate Team Oct. 27-30th to receive a Most Feared Master Brian Urlacher for free. See here for the details of the full update. In FIFA Ultimate Team, FIFA 17 will unveil frighteningly good transformations of 23 of the world’s biggest soccer playerssuch as Andrea Pirlo, Thomas Müller, Dimitri Payet, etc. with “Ultimate Scream” player boosts. 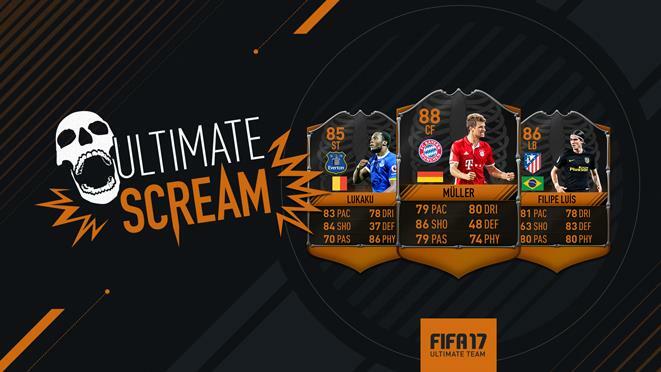 From Oct 21st – 28th, the “Ultimate Scream” players will be available in packs with upgraded ratings as unique items. During the Halloween Weekend (Oct 28 - Oct 31) these players will “come alive” and get a huge temporary ratings boost. The full 23 Ultimate Scream players can be found here. In NHL 17, gamers can go on a virtual trick-or-treat. From now until November 4th, fans that collect five distinct candy collectibles will unlock high value players within HUT. The collectibles, chocolate bar, foil wrapped candy, lollipop, candy cord and licorice can only be obtained in special Trick or Treat packs and fans can take them and combine them with other items (Carbon Collectibles and Gold Collectibles) to receive different rewards. There is also a 6th MASTER collectible (bag of candy) that fans can receive by completing an Epic Player Set. Check out the EA SPORTS NHL 17 twitter and website for more details.